To make my pots extra strong, I added 1/2 cup of nylon fibers. I ordered them from Amazon, and I have a feeling the 1 lb. bag will last me a lifetime. I spent a long time thoroughly mixing the dry ingredients. It seemed like a good idea to ensure proper bonding. Then I added 3 gallons of water and mixed everything together. I had underestimated how long this would take. I spent a good 10 minutes at it, but again I wanted to make sure everything was mixed well. For molds I had chosen cardboard boxes. I had plenty on hand, and I wanted rectangular shapes instead of round. I simply pressed the mixture into each box (about 2 inches at the bottom) and built the walls to be about 1 1/2 inches thick. I didn’t line the boxes with plastic, like some people suggest. I don’t think plastic is needed, but I could be deadly wrong. But I figure even if there are bits and pieces of cardboard stuck to the side of the pots I can remove them using a wire brush. Time will tell whether my assumption is correct. Looking at the finished pots, I think my mix had a bit too much water in it. I don’t think it’s detrimental, but the hypertufa will take longer to dry. I wrapped the finished pots with plastic drop cloth and will now let them set. There is a great deal of divergent information on the Internet regarding this step. Some people say 24 hours, others 2 days, others a week or longer. Logically speaking this all depends on the ambient temperature and the humidity. Considering today’s high is expected to be in the low 70s, I will check tomorrow afternoon (i.e. 30 hours later). I will then make drain holes using an apple corer and, if the hypertufa is dry enough, remove the cardboard and brush the outside with a wire brush for a more natural texture. It will then take another 2-4 weeks for the hypertufa to fully cure. After that some people suggest waiting 1-2 months for the material to age before planting because Portland cement has a high lime context that would damage plants. This project was lot of fun. I’ll collect more boxes and look for other molds. As I get better at this, I want to make larger troughs like this one. Looking forward to seeing the finished product! Might have a go at doing some this year, your recipe will come in handy. On day 2 it looks like the recipe was a good one. The pots are nice and solid. 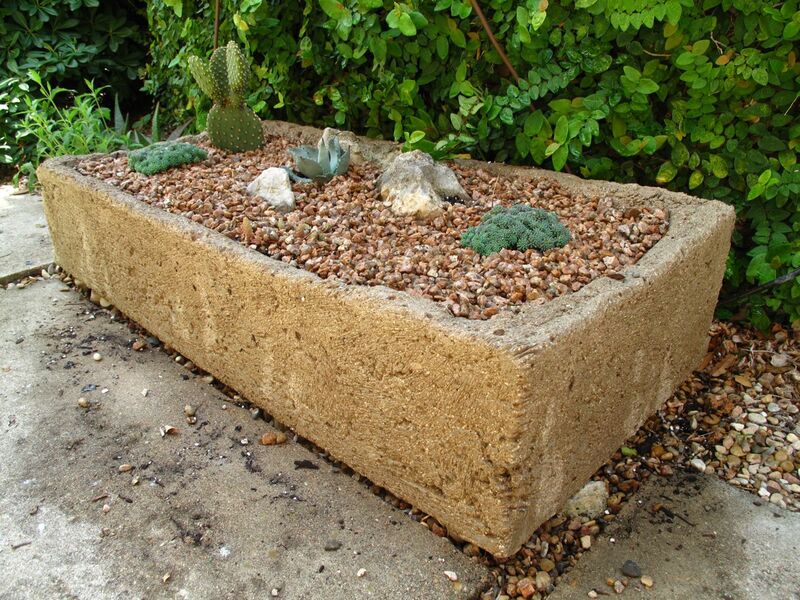 I've been wanting to make some hypertufa troughs for years as well. One of these days I'll finally get around to it. I'm looking forward to seeing how yours ultimately turn out and seeing what you plant in them. Alison, I can already say that it was easier than I had expected! I don't know what I'll plant in them yet because they're a bit on the small side. But I'm sure I'll find something in my collection :-). How tall is your tallest one? It's hard to get a sense of scale. I did wear one of those silly paper masks when handling the cement. Was uncomfortable but did the trick. I added the outside dimensions to one of the photos above. The tallest container is 9 1/2 inches on all sides. I've seen the finished product and they look really great! Are you able to confirm whether your peat moss was dry when you measured it? It looks like it, as your thorough mixing looks to be all dry ingredients, I just wanted to double check. There are lots of recipes around but peat expands a bit when dampened so I've always been curious about this! This is on my list of things to try. it is so hard to find good troughs for succuelnts and alpines in London. Those look excellet, and interesting to see you just filled inside of cardboard boxes. Looking forward to seeing how they turn out. I love these, and I think you did a good job. I like cardboard boxes as my mold because the shapes are boundless. I also want a "big" one.